Consumer centricity has returned or finding its way into most of the businesses in emerging economy like India. Consumer 'needs' and 'willingness to pay' for good quality products and services is driving a whole new era of competition. It first started in luxury industry with high economy class consumers, where there was established 'willingness to pay' for better services and then slowly start penetrating into other sectors and also lower economic classes and raising their 'aspirations'. These phenomenon is creating a whole new market and driving innovations from bottom-to-top. The aviation, telecom (mobile and internet) and various other industries has seen this Consumer cycle. India's Power Distribution sector has begin its journey of enabling 'diversity' and adding more 'choices' to its electricity customers. Like other sectors, the cycle first began with high volume or developed consumers through 'top-down' innovation like 'Open Access' and now we have started hearing of 'bottom-up' innovation like 'Pre-paid metering', 'Net-metering' and 'Distributed Generation based Distributed Franchisee (DGBDF)'. The to-be leaders in the Power Distribution space will soon have to learn this change that is sweeping the country and include the end-consumers into the designing and co-creation of solutions and soon also accept equally the urban and rural consumer mix to drive bottom-top innovation. The new saga is to forgo or overcome references like BPL, APL, agri (or rural), tariff subsidies and free power, but start innovating scalable ventures to meet the needs and challenge. Grameen Micro Financing model first innovated at Bangladesh is now widely accepted and MFI is a very big and fast growing industry with strong developing linkages to the main streamline capital industry through various derivatives. Remember this all begins with a 3 letter word - KYC i.e. 'Know Your Customer'. Its an important phase after you are done with Market Analysis through KYM i.e. 'Know Your Markets'. KYC should be a pre-cursor for high confidence KYI i.e. 'Know Your Investments'. Our recent discussions with prospective bidders for Distribution Franchisee tenders in 9 districts of Madhya Pradesh (MP) was full of encouragement for our recently conducted 'Customer Satisfaction study for Electric Utilities' in those regions. Most companies easily perceived our work's importance to operating Distribution Franchisee post the bid win for regular (internal & external) benchmarking of Customer Satisfaction to evaluate and better prioritize their system investments and efforts. Almost all experienced companies in running Distribution extended the applicability of our Customer Satisfaction research also to the pre-bidding phase. They found it will add an important perspective to their already on-ground technical due-diligence and help them validate their assumptions on Capex and Opex plans for bidding. How does pManifold's Customer Satisfaction study fit in the Pre-Bidding phase? In lack of missing information on Asset health in the RFP and low confidence on quality of data, the bidders are left with no choice but to take due-diligence on-site for collecting this information and then estimating Capex, Opex and Load growth across various customer segments. The study allows bidders to jumpstart on-site due-diligence by pointing location specific key areas of concerns for power delivery services across 28 key business performance indicators. This becomes input to on-site due diligence team for more focused causal analysis of specific locations for specific attributes. Additionally, it is more applicable for the districts of Madhya Pradesh where habitation is scattered and geographic terrain is hard to cover, representatively, to derive any useful consolidation of on-site findings and then defining investment numbers. The GIS map indicates the sample respondent's satisfaction level (in red, orange and green dots) for specific attributes. The consumers are clustered into 4 categories namely Residential, Commercial, Industrial and Agriculture marked by 4 different colored box boundaries. Grids with high relative numbers of Red (Very Dissatisfaction) and Orange (Dissatisfaction) dots should raise a trigger for on-site team to look into causes of dissatisfaction. 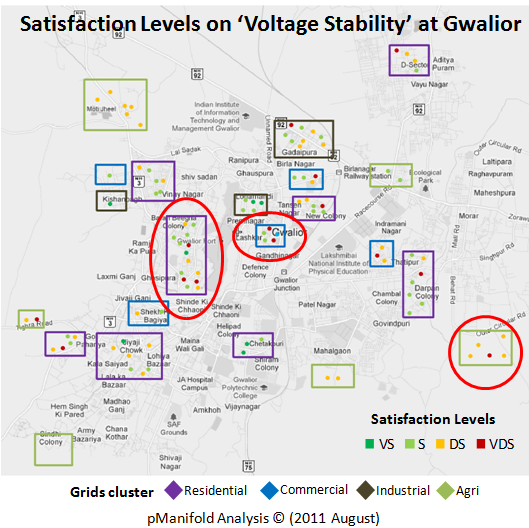 Voltage stability seems to be problem in Gwalior city with overall more than 50% dissatisfaction. High paying urban consumers including 'Commercial' and 'Residential' also seems to struggle with the problem. Rural areas outside city limit has aggravated voltage stability issues. Visualizing the results in this GIS form will aid the on-site due-diligence team to go for specific customer segmented pockets and prioritize their time. 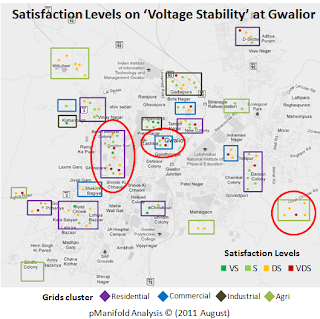 The 'voltage stability' interventions will have major impact on Capex planning for the area. Industrial consumers are supposedly high return customers for utilities revenue. 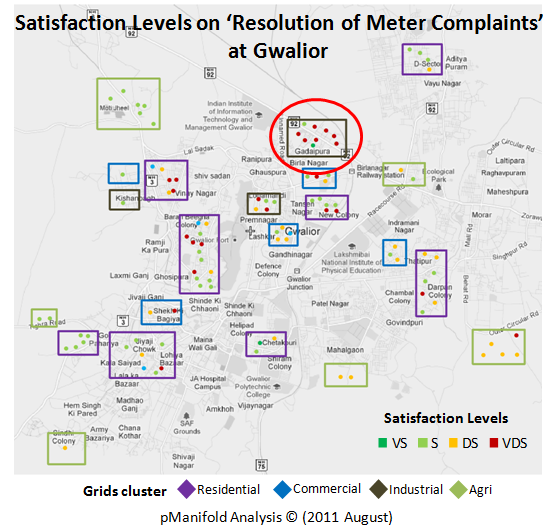 In Gwalior city, the Industrial belt of Gadaipura seems to suffer with significant 'customer service' related problems on 'Metering Complaint Resolution' to result into 67% 'Dissatisfaction' indicated by red and orange dots. 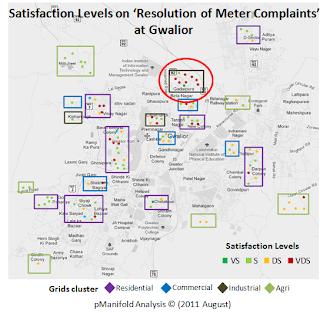 Gwalior has almost 100% Electronic meters for Industrial consumers. The problems if vested into replacing meters then it would result into another huge Capex involvement for the Distribution Franchisee. If problem is more vested into improving processes and protocols for handling customer services and aiding with Meter testing services, then that would have implication on Opex planning for resources, inventory and lab testing. There are more correlation analysis that come as supplements in the CSAT study which indicate customer's willingness to pay for additional premium services, its sensitivity to 'Prices' and 'Value for Money' and also its acceptance to privatised distribution. All these together with socio-economic indicators and demographics of the area influence the customer acceptance of the Distribution Franchisee model and initial roll-out of DF operations and hence its associated delays, contingencies and Risks to the Investments (both systemic and idiosyncratic types). For individual reports on each region, please get in touch with Rahul Bagdia, +91 956 109 4490, rahul.bagdia@pManifold.com.